Hey y’all! I’m Layne, a small-town working wife and mom-to-be. I’ve been blogging for a few months now, initially as a way to document my feelings and the events during the process of buying our first home and my first pregnancy. However, I very quickly found it to be a great way to document life in general, meet awesome people living life one day at a time (just like me) and get tons of great info and advice from fellow homeowners, wifeys, and mommies! I really hope you’ll stop by my blog and follow me, I’d love for us to be friends! Make Art out of your Leftover Wedding Invitations! 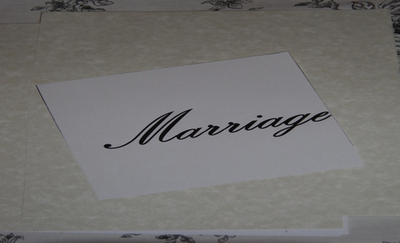 Find at least one (preferably two) of your wedding invitations. For me, this required having my mom ship me some, because she is the hoarder and keeps everything. Frames. 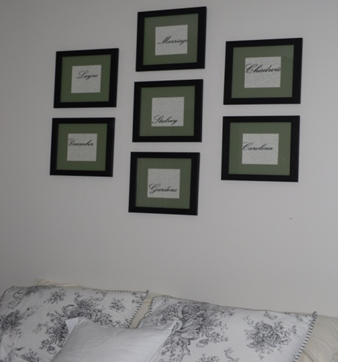 You will need 5-9 square frames, color and style of your choice, but the more simple the better. I chose 7 12x12 black wood frames. The key to finding the right frames at the right price is this: don’t have a design or number in your head until you start looking, you think you want 9 but you only find 7, and they’re super cheap-go for it. Be flexible. I decided to wait until a special occasion and ask for mine as a gift. What’s cheaper than free?? Matting. 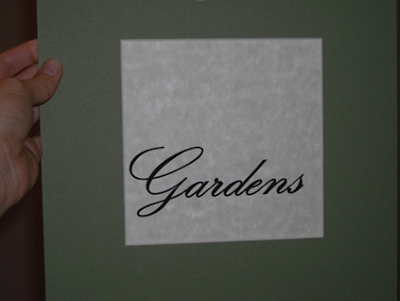 To give this a polished and professional look, you really need mats to go in the frames. Depending on the size and degree of fanciness that you are looking for this can range from cheap to more expensive than you think. I knew I wanted solid “sage” green mats, no special material. I went to my go-to for art projects, Hobby Lobby. Their art work and framing is always 50% off. Seven mats to fit in 12x12 frames and showcase 5 ½ x 5 ½ art cost me $35. Not too bad. The art. 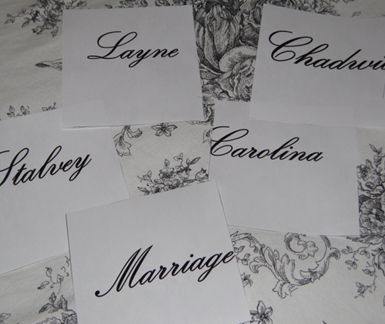 The original idea said to pick certain words or phrases off of your wedding invitation that were special to you, to take them to a copier shop and zoom in 200-500%, crop and print. Easier said than done from what I found. Most copy shops don’t have this capability, and if they do by zooming in you make the image grainy. I found that there were two plausible options. 1. Kinkos said for something like $40 they would take the invitation and my instructions and send it off to be done at Kinko’s headquarters. I think this would have been great but I was on a budget so I chose option 2. I copied the text I wanted into my choice of word processor, blew it up to the size I wanted and cropped it accordingly. 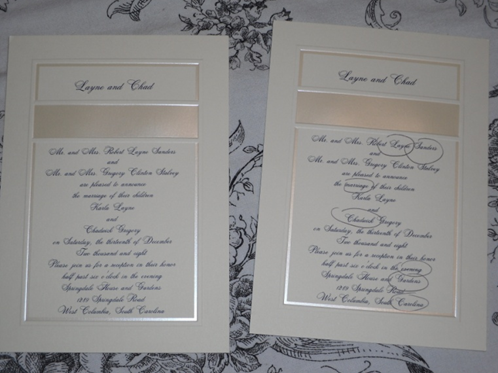 I used Microsoft Word, and it didn’t have a font as elegant as the one used on my invite, so I was able to download almost the exact font off the internet and use it that way. The artsy-ness of it all was that it shouldn’t be even, or centered. Some words should be cut-off, some should be off-centered, etc. Paper. To give the project a finished look: print the art onto parchment paper to be framed. I went to my local office supply chain store and found that they sold fancy paper by the sheet! I have 7 frames, so I bought 14 sheets of parchment for .20 cents each. It’s always good to leave room for error, especially if you’re naturally clumsy and untalented, such as I. Put it together! I practiced the printing on computer paper first. I used a ruler and very sharp succors to cut the paper. Like I said, I’m not a crafter, so I don’t own one of those fancy paper slicing machines with the grids so you know you’re cutting straight. Also, due to my lack of previous crafting I simply scotch-taped the parchment paper to the matting and put it in the frame. Hang it. You want to make a design on your wall. Like I said, a lot of the “coolness” factor is the asymmetry of it all. I had 7 frames, so I did 3 rows of frames in vertical lines, 2 frames- 3 frames- 3 frames. This was the hardest part for me. Let’s just say there are some extra holes in my wall now. 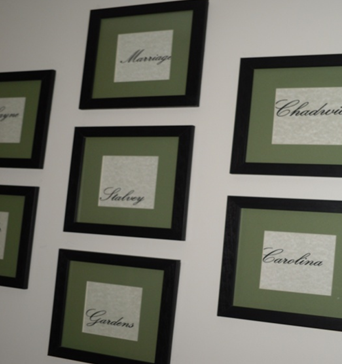 Because of the nature of the square frames, it is very noticeable if the lines are perfectly straight or the frames are hung crooked or off-centered. Step back and revel in your craftiness and new décor! So pretty!! I love the name of your blog--I <3 my glue gun too! I'm hopped over from the I <3 blogging hop and following you now--would love a follow back! Hi!! I'm stopping by and following from Mid Week Mingle Blog Hop. I hope you'll check out my blog Frazzled Mama at http://frazzled-mama.com and follow me back. Have a great week. Very cool! Such a great idea. Thanks so much for visiting my blog. I appreciate your comment. 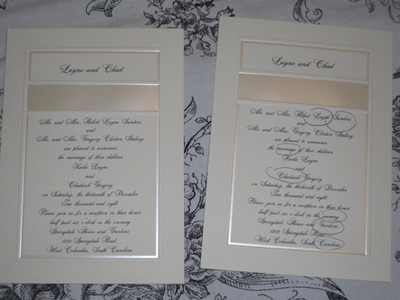 This is a wonderful idea and earth friendly, since you are reusing the invitations! Hello from your newest blog follower via Mid Week Mingle! Whoa! Thanks for sharing those step-by-step instructions. I know that this crafts will be useful for some. Anyway, I like your blog. It looks so girly. Keep it up!